We’d love your help. Let us know what’s wrong with this preview of 750 Years in Paris by Vincent Mahé. A literary graphic novel unlike anything else on the racks, 750 Years tells the story of our time, focusing on one single building in France as it sees its way through the upheavals of history. Beginning in the thirteenth century and making its way towards today, this historically accurate story is the eagerly anticipated debut from Vincent Mahé. Vincent Mahé is fast being A literary graphic novel unlike anything else on the racks, 750 Years tells the story of our time, focusing on one single building in France as it sees its way through the upheavals of history. Beginning in the thirteenth century and making its way towards today, this historically accurate story is the eagerly anticipated debut from Vincent Mahé. To ask other readers questions about 750 Years in Paris, please sign up. A beautiful Nobrow silent graphic novel with 60 different depictions of a single building in Paris over 750 years, from 1265 until the present, with each colorful illustration reflecting that period, that culture, that time. Because I am a US American, I struggled through which historical events were being depicted, getting a general sense of it, sometimes recognizing specific moments, until I got to the end and saw there is a timeline in the appendix, linking an event and year to each illustrat A beautiful Nobrow silent graphic novel with 60 different depictions of a single building in Paris over 750 years, from 1265 until the present, with each colorful illustration reflecting that period, that culture, that time. Because I am a US American, I struggled through which historical events were being depicted, getting a general sense of it, sometimes recognizing specific moments, until I got to the end and saw there is a timeline in the appendix, linking an event and year to each illustration. Mahé's work here is in conversation with Richard McGuire's Here, which is more complex, multilayered, but Mahé's book is also pretty fascinating. Like Here, it is a depiction of one building (with Here it is one room in one house, or what preceded and postdates the house) over many centuries. The focus is on time and space and history seen through one building that is always changing, damaged by fires, being redesigned in each age, and so on. The architectural focus here is that buildings speak histories. Like Chris Ware's Building Stories. Or Edie Fake's Memory Palaces. This lovely graphic novel is an almost wordless picture book. The unfolding of 750 years of history plays out against the back drop of a single building in France. In each illustration changes are made, and part of the delight of this book is figuring out what has changed with the building and building materials, but also what people are wearing, how are they getting around, and who are those people in the upper windows? I recommend reading it as I did with a finger bookmarking the page in the ba This lovely graphic novel is an almost wordless picture book. The unfolding of 750 years of history plays out against the back drop of a single building in France. In each illustration changes are made, and part of the delight of this book is figuring out what has changed with the building and building materials, but also what people are wearing, how are they getting around, and who are those people in the upper windows? I recommend reading it as I did with a finger bookmarking the page in the back, which briefly describes significant dates in history, so as to easily be able to flip back and forth between the two. As you flip the pages one appreciates the grand scale of time, the transitory nature of cultural upheavals, and the insignificance of any one individual life. 80 pages, no text, depicting the same plot of land over 750 years. It's a heady reminder of just how SHORT the timespan of history I'm used to thinking in terms of is. The nazi occupation of Paris barely merits a mention. We've seen worse than that from our own people within the last generation, and this house has seen two revolutions and a fire and still stands. I loved this concept, though I do wish there were a more detailed timeline at the end. Gorgeous bold contrasting colour palette, that reminds me of vintage Eastern European Children's book illustration. Who doesn't love teals and orange together?! This title follows 1 piece of infrastructure in Paris over the period of 750 years - following a seemingly accurate depiction of architectural history. It is essentially wordless, with a very brief timeline summary on the final page. I enjoyed the colour and illustration -- but, being a plotless and textless novel, I suspect is not somet Gorgeous bold contrasting colour palette, that reminds me of vintage Eastern European Children's book illustration. Who doesn't love teals and orange together?! I enjoyed the colour and illustration -- but, being a plotless and textless novel, I suspect is not something I'd pick up very often. Maybe would be good as a coffee-table book to flip through and enjoy at random. This graphic novel is rather special. It has no words. It starts with a drawing of a building in France 750 years ago and each subsequent page travels forward in time. By the end we see the building draped with banners that say "Je Suis Charlie." The history of France is depicted through the changes in the building. This was like the book version of Miniatur Wunderland, a museum we visited in Hamburg, Germany last year, which featured - among other things - an exhibit of a series of dioramas of a This graphic novel is rather special. It has no words. It starts with a drawing of a building in France 750 years ago and each subsequent page travels forward in time. By the end we see the building draped with banners that say "Je Suis Charlie." The history of France is depicted through the changes in the building. This has quite wet my appetite to read some French history. It's like a picture book of war. Seven hundred fifty years of French history from the 14th century to the present as witnessed from the perspective of a building in Paris. Remarkable. Fantastic, fascinating look at history through architecture (and life's smaller details/objects) and a beautiful use of limited palette. This was just plain cool. A fun one to read with someone else and point things out to each other. ......Well that was useless. This summary is severely misleading. It says this book tells a story focusing on one building. Which would be great if it were like The Little House by Virginia Lee Burton. But it's not. IT's just pictures of the same building century by century with no words. I like books with no words but I mean. This book doesn't have a story.....?! Waste of paper, this book is. Normally, I would think a book with illustrations of drawings of the same building through the years would bore me. However, I absolutely loved this. The detail in the images was amazing and the timeline in the back helpful. This book is great for Paris, architecture, history and art lovers. It will make a great coffee table book! An interesting little art project; a look at one building (or rather one plot of land and the varying structures that inhabit it) over the course of 750 years. There's a timeline in the back describing which events are being shown in each picture, which I wish I had known about in advance. Really a 3.5 star rating. A lovely, wordless graphic novel that does exactly what it says on the tin: it follows one building on one block in Paris for 750 years, from its humble medieval beginnings through political upheaval, fires, revolutions, protests, wars, and rebuilding to its current, modern iteration. Gorgeous art and a really cool concept. I'm an architecture nerd so I gravitated towards this. It tells the tale (without any words) of a single building over the course of 750 years in Paris. This book really brings home the notion that architecture reflects the times perhaps better than anything else. The history of a single Parisian building during the course of hundreds of years of history. I love books like these, where I compare what's different between each drawing. 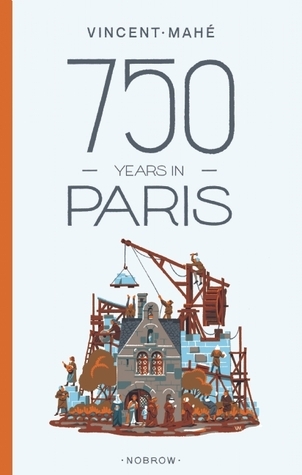 This is a fun graphic novel looking at a single building in Paris over 750 years of history. I liked it, but the idea interested me a lot more than the execution. Comme la art de Helen Lundeberg pour le WPA, ce livre serait una œuvre magnifique pour apprendre la histoire. I love the illustrations and the way the pictures change from year to year. Vincent Mahe is a Paris-based illustrator who also is known as Mr. Bidon. His bright and crisp illustrations, informed by a lively wit, are becoming well known in Europe, (search the internet and you'll find a huge portfolio of drawings), but he was new to me. Looking over some of his published work, I was particularly taken by a series illustrating the Seven Deadly Sins and a series titled "Neighbors" that consists of very amusing views of the shenanigans taking place in the apartment blocs surrounding Mahe's studio. The building itself, of course, is distinguished mostly just by how well it reflects the styles of the times. It's built, it burns down in part, it's demolished in part and rebuilt repeatedly, it's added to and modified. You end up with a time lapse view that is really quite engaging. But beyond that, there is a remarkably puckish good-humor informing each illustration. There are a lot of visual jokes and sly bits of business built into each drawing, especially as we move closer to the modern era. Just watching which businesses come and go on the first floor of the building is sort of a hoot. And, of course, styles in clothing, vehicles and the like change dramatically from scene to scene. This is a truly amusing find and a visual treat. If you like drawing, illustrations or graphic design, Mahe is a great find. The concept for this book is fantastic. Basically, the illustrator selected one spot in Paris and illustrated its development over 750 years of history. From tiny wooden ramshackle house to multistory stone beauty, you watch it get built and rebuilt. And you see the fires, the plagues, the floods, and, of course, the revolutions. There are no words throughout, which really encourages you to pay attention to what is being shown. To notice the tiny differences (or not so tiny differences) from pic The concept for this book is fantastic. Basically, the illustrator selected one spot in Paris and illustrated its development over 750 years of history. From tiny wooden ramshackle house to multistory stone beauty, you watch it get built and rebuilt. And you see the fires, the plagues, the floods, and, of course, the revolutions. There are no words throughout, which really encourages you to pay attention to what is being shown. To notice the tiny differences (or not so tiny differences) from picture to picture. And as a little bonus at the end, you get some brief descriptions of the events being shown. I think it would be a delightful read for someone better-versed in Parisian history than I am, but I also think it's very accessible for people who couldn't tell their Napoleons from their Antoinettes. And it's quite possible that one of these illustrations could spark enough curiosity to learn more about these historical events. I read my copy as an eBook, and the one thing I would say is that I think, in this case, I missed that print book experience. I think I would have preferred being able to quickly flip back and forth through illustrations, seeing at a glance how much had changed. Or to be able to flip forward to the explanations when I had a question about what I was seeing. It's a bit tough to do in e-format, but I wholeheartedly suggest taking a look at the print edition. It doesn't take long, and the reward is worth it. Vincent Mahé is an illustrator based in Paris.